Chef Linda Rosario is a food blogger from Chef Needs, one of the trusted suppliers of bakery display cases. In this article you are going to learn how to make Meat Tagine Tfaya, this Tagine is usually made to celebrate an important even in the Muslim world. First we are going to brown the meat and onions so we are going to use butter not oil in this this, butter is used on dishes that are celebratory. Add the finely chopped onion, than add the spices. It is very important to add some saffron in this dish because that is what gives it a really nice flavor, make sure to mix all the ingredients and once the butter melts add the meat. 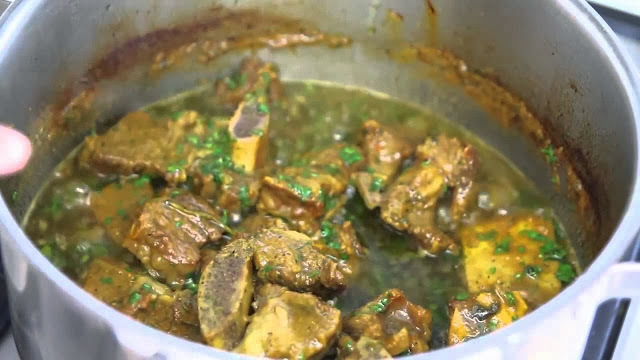 You can either use lamb or beef but preferably use pieces that have bones, something like leg, shoulder or ribs because the bone really adds a unique flavor to the dish, cover the pot and stir from time to time until the meat turns brown. Once the meat becomes brown add a bouquet of cilantro and then cover it with water, we are going to let the meat cook until it is ready, that is until it becomes really soft, from time to time check on it and add water if necessary. After about 20 minutes the level of water will go down but the meat still needs more time to cook so I am going to add more water because the meat needs to cook more.After about 40 minutes the water is reduced again, the meat should be really soft so try to use a fork to check if the meat is soft. Next, we need to do the final steps, start by removing the cilantro, and we are going to add finely chopped cilantro, make sure to taste the sauce and adjust the salt and pepper accordingly but don’t salt too much because we are going to keep the sauce cooking without the lid. While the Tagine is cooking we are going to fry the almonds, make sure to heat the vegetable oil first and fry them for a few minutes until they become brownish but don’t cook them too much because they will burn. When the almonds are ready remove them from the oil and place them in a bowl covered with a paper towel in order to absorb any excess oil. After the sauce has reducer you are ready to serve the Tagine, start by placing the meat into a nice clean and white plate, then you add some of the sauce and finally you add the boiled eggs.Make sure to put the boiled eggs around the meat and finally you top it with the fried almonds so you can put a bunch of almonds in the center and place the rest around the dish. Serve it with a French baguette and some nice Moët etChandon Ice Imperial and you will dine like a Moroccan prince.